Action RPG game created by Obsidian Entertainment studio. The Outer Worlds takes us to the retrofuturistic universe, to be more precise, to the destructible Halcyon colony, which is the furthest point on earth. The Outer Worlds is an action RPG game developed by Obsidian Entertainment studio. We are talking about a team whose portfolio includes such productions as Star Wars: Knights of the Old Republic II - The Sith Lords, Fallout: New Vegas or the Pillars of Eternity series. The game was released by Private Division - under this brand Take-Two Interactive helps independent developers. It is worth noting that the title was supervised by Leonard Boyarsky and Tim Cain, the developers to whom we owe the creation of the first installment of the Fallout series. The Outer Worlds takes place in a retrofuturistic universe. We play the role of a spacecraft crewman awakened from hibernation, who was sent to Halcyon, the Earth's colony located on the outskirts of the galaxy. As it soon turns out, the days of the institution may be counted - the protagonist encounters a trace of a conspiracy directed against it. How the fate of the colony will unfold and what role the hero will play in it depends on the player's actions and decisions, as well as his relations with characters and factions functioning in the game world. In The Outer Worlds the action was shown from the first person perspective (FPP). The driving force behind the game are role-playing tasks and side missions, which the hero can perform alone or with companions controlled by artificial intelligence. These characters can join us in the course of the adventure, and they are equipped not only with their own stories and motivations (separate quests are associated with them), but also with individual skills. In order to get to know each of them better, it is worth to look on board the ship from time to time, where we can meet other crew members. By traveling through various locations, where you can find both picturesque landscapes and interiors of buildings and space stations, we face various opponents - from hostile people, through combat robots, to monsters that are the fruit of a failed terraformation process. In real-time clashes, as important as the combat potential of our arsenal and weaponry is skillful juggling the abilities of the heroes. As the protagonist progresses, he or she gains experience and progresses to the next level, gradually expanding the range of skills (which can be useful both on the battlefield and during conversations with the NPC). Against the background of other representatives of the species, The Outer Worlds distinguishes the system of so-called flaws - the game follows our actions, trying to find an activity in which we are not particularly good. He then offers us a related debuff; if we accept it, we will get an extra perk in return. 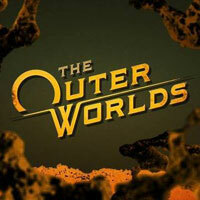 Thanks to the original, retrofuturistic stylistics, the visual sphere of the game The Outer Worlds you may like it. Attention is drawn above all to carefully designed locations, as well as detailed models of characters, enemies and armament. The struggle takes place with the accompaniment of atmospheric soundtrack.